ELBOX Ltd. has been established by Mr Jerzy Figlus and Grzegorz Kucharski in 1988. At the establishment date they both had several years of work experience gained mainly during building of Belchatow Power Plant. The intention of consorts was to create medium size, resilient, electrical firm, being able to move easily in modern, industrial plants, where they could fully use their technical knowledge and experience. The company quickly achieved a good brand and expected orders followed. Currently we are executing electrical works in both industrial plants and general building industry. With the flow of time we widened our range of services with C&I and low current installations such as CCTV, Access Control, Fire Detection, and Structural Cabling. Trying to meet a market demand we opened up a design section, working up on electrical and low current installations. At the moment ELBOX employs 46 workers of which there are 6 engineers, 14 technicians, 22 experienced electricians and 4 administrative workers. Our employees possess all necessary powers and qualifications required by Polish law. The company also has its own accountant and EHS inspector. In 2007 we moved our headquarter to a 12000 sq ft facility with offices, workshops, changing rooms and stores. 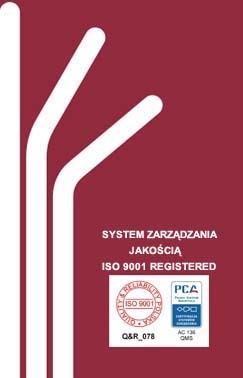 In 2005 we implemented Quality Assurance System according to ISO 9001. The certification scope is "Designing and executing of electrical and C&I installations and assembly of 0,4kV switch boards". Knowledge, experience, competence and flexibility are our main assets and our main goal is client`s satisfaction. We would like to invite all interasted parties to cooperation. 2.03.2015r. Będziemy uczestniczyć w budowie zakładu produkującego biopaliwo.